Winners of 6 league titles in the last 11 years! There are some in sports who believe if you don't win your last game of the season, it was all for naught. Having witnessed the 2018 Wayne Wolverines season close-up and firsthand, this Father/Coach/Fan/sports-enthusiast would beg to differ. By all accounts the season was a history-smashing success. The 2018 Sr Wolverines went farther than all those before them, eventually losing 6-3 in the Region 3 tournament final to the defending region champ Spring City. Our goal was to win the district championship, again. And we did. The boys played 24 games this season. They played with 20 different line-ups. They won 13. They played short-handed, they played out of position (A LOT!). They played in the heat, they played in the rain. They waited around a lot in the rain too! The older guys led and the younger guys grew in front of our eyes. They jelled and became a team at the right time. The perfect time. The last chapter saw a 5'4" outfielder with a heart bigger than you can imagine, climb the mound in the regional championship game having never pitched before. He and his teammates fought until the last pitch. Then they smiled at each other, hugged each other, and went to shake hands with the Red Sox from Spring City. Its a game, its supposed to be fun. It was a fun season. Wayne takes out Yardley-Morrisville in a game that took 2-days due to weather. Cole Humes was virtually unhittable striking out 7 and giving up only 1 earned in a little more than 4 innings. Evan Moore held Y-M scoreless for the last two innings, to help preserve the W for Humes and the Wolves.The bats were lively and the team was ready. It was a fairly easy 6-2 victory. Moore and Dane Gresiger were the engine in the middle of the line-up they've been all year, going a combined 4 for 7 with 4 RBI, 2 doubles, 2 stolen bases, and a walk. The game was scheduled for a noon start, 1pm at the latest due to possible weather. The boys arrived at 11/11:30 to warm-up. We finally took the field at 3:40pm due to the prior game going 14 innings. We came out flat. We didn't hit, we didn't pitch, we only kind-of fielded. Spring City rolled to a 10-0, 7-inning win. End of story. This is the game that Wayne would traditionally not "show up" for. Its incredibly hard to make it anywhere in one of these tournaments once you move over to the losers bracket. On top of that, we lost our lead-off hitter and clean-up hitter for the game due to other commitments. AND, due to Legion pitching rules, we couldn't use any of our top three pitchers other than 20 pitches left from Shepherd. Would have been easy to pat ourselves on the back and call it a good season. The Wolverines scraped and clawed and battled and earned a 6-5 decision over the foes from the Norristown area. 4 different pitchers, a one-armed catcher, and a little magic. Doc got the win. Shep got the save. Luke Kania led at the plate with a 2 for 3, 2 RBI performance. Darien pass also had a good game at the dish and Shep went 2-3 with an RBI and run scored. (cue the cliff-hanger music) Would the Wolves stand-up against their district nemesis? Would they have any juice left? Would we be able to field a team?!?!?!? Having thrown less than 45 pitches in the first game, Evan Moore was available for this one. He was up to it. Moore held off the boys from the state-champion Marple-Newtown H.S. baseball team, with a complete-game 1 earned-run performance. Lots of help from the defense was needed, and we needed some hitting too! In the end, Wayne earned a trip to the region 3 championship game with a 5-4 victory over a loaded Broomall-Newtown squad. The offense was sparked by a 3 for 4 showing from Avery Shepherd. Shep eventually drove-in the winning run in the bottom of the fifth, with a sharp single that scored Moore, who had doubled 2 at-bats prior. Wayne pounded out 9 hits and coaxed 5 walks from BN pitching. The best stat of the game: all 5 runs were driven in via 2-out hits. The boys were up to it, and they delivered. Wayne went into the championship game thinking our ace Cole Humes was going to take the bump, and we were ready to rally behind him. Unfortunately, the team scorekeeper/statistician/administrator (the schmuck writing this), screwed up the math and the tournament officials declared Humes ineligible to pitch due to earlier pitch count. Coach B won the toss again and Dane Greisiger got the start on the mound. The first inning was over quickly as both teams went down in order. In the top of the 2nd, Dane wasn't feeling well. Coach B, completely out of pitchers at this point, got creative. He looked into left field and tapped his right arm for Luke "Skywalker" Kania (nickname courtesy of Coach Moe). Sidebar: this is why we love sports, the original reality TV > because you have to play the games. And sometimes (a lot of times) the outcome is not even close to what is logically predicted. Kania held down the defending regional champs for five innings, inducing pop-ups, ground-outs and yes, the occasional hard-hit ball that found a Wayne defender. Wayne tied the game in the fifth inning: Darien Pass led-off with a scorched double and Cole followed with an RBI single. After another well-placed sac bunt from Evan Johnson, the three-hitter came to the plate. Evan Moore did what he has seemingly done all season in this situation and he laced a single past the short-stop to score Humes and tie the game. While at the same time making Spring City veeeerry nervous. Wayne threatened in the 6th, but to no avail. The Wolves went into the 7th inning tied 3-3. Spring City did their thing in the 7th and posted three runs to win the game 6-3 and go back to the state tournament. And this Wayne team walked off to enjoy what's left of their summer, and into history. Thank you for supporting the players and coaches all season. And most of all, a very special thank you to our "graduating" 19 year-olds: Darien Pass, Jack "Doc" Dougherty, Evan Moore, Cole Humes, Dane Greisiger, Nick Holtz and Zane Thompson-Bradley. You will never be forgotten and you will always have this season to own. You are more than welcome to come back to Odorisio to throw BP, and share you experience and baseball IQ with future generations of Wolverines. Wayne eliminates B.N. to advance to Region 3 title game. Familiar foes faced-off in an elimination game in the PA Region 3 Sr Legion tournament. Unfortunately one had to go home with their 2nd loss. Kudos to Main Line Legion for having 2 of the remaining 4 teams in the tough regional. Evan Moore took the start for the Sr Wolverines, facing some Broomall-Newtown players he has seen almost a dozen times before, via other legion and high school starts. And they've seen him too. It was business as usual for Moore and the Wayne D as he pitched to contact, and the D made (almost) all the plays. Wayne posted a 5-4 win and Moore delivered his 5th complete game and 6th win of the season, ceding only 1 earned run on 6 scattered hits and 2 free passes. 13 of the 21 outs came via the air as B.N. was slightly off-balance and reaching most of the afternoon. After not making much noise in the first 3 innings, BN scored 3 unearned in the 4th, on one single. They posted their 4th and only earned run, in the 5th on a triple that was crushed to right-center by Corey Woodcock. He scored on the next at-bat as the hitter placed a perfect squeeze bunt. Wayne worked out of trouble to avoid any further damage, including nailing the potential tying run in a run-down just 20 feet from the plate. The offense was powered by Avery Shepherd (SS) who was 3-4 with a double and 2 RBI, and Grady Nance (1B) who was 2-4 with a double and 2 RBI. Darien Pass (2B) also had a key 2-out RBI single. All of Wayne's 5 runs were driven-in via 2-out hits. Wayne opened the scoring in the 1st inning as Evan Johnson (RF) was hit by a pitch. Dane Greisiger (3B) trotted down to 1st next, when a catchers interference was called. That brought up Shepherd who smoked a 2-out double to the gap to score the speedy Johnson. 1-0 Wayne. The Sr Wolves would take a 2-0 lead in the 4th when Nance doubled, then advanced to 3rd on a passed-ball, and scampered home on that key Pass left-field single with 2-outs. BN would take a 3-2 lead in the bottom half of the frame (as described above), but it was short-lived. More 2-out magic from Wayne with a Greisiger walk. Dane was then chased to 2nd base by a Shepherd single. Luke Kania (LF) then walked, bringing up Nance to poke a clutch 2-RBI single, scoring Dane & Shep. 4-3 Wayne. BN tied it in the bottom of the 5th on the aforementioned triple & squeeze, but again, 2-outs in the next frame didn't stymie Wayne. Moore helped the cause with a smashed 2-out double down the third-baseline in the top of the 6th. Dane then walked again. Shep came up and laced a 1-1 pitch into right-center to score Moore and post the winning run. Wayne's historic season continues tomorrow, as they face perennial power Spring City in the Region 3 championship game at 10am at Downingtown East High School. No Wayne Sr Legion team has ever won 2 games at a regional. This version has won 3 and advances to the championship game. Spring City beat Wayne 10-0 in an earlier winner's bracket game. Wayne must beat Spring City twice to win the title and move on to the state championship tournament in Boyertown, next weekend. The Red Sox endured the delay as well, and came out ready to play, beating Wayne 10-0 in 7 innings. Wayne goes to 1-1 and moves to the losers bracket. With the 6-5 win in game three this evening, Wayne eliminated Chadwick's and advanced farther in the PA Region 3 tournament than any Wayne team since at least the 1970's: And the 2018 Sr Wolves had to do it with "one hand tied behind their back." Pitching rules eliminated Cole Humes and Evan Moore for this game, and Shepherd only had 20 left on the day. The team lost Cole and Dane Greisiger to prior commitments, and went in to battle with just 10 players. Despite the odds, Wayne found a way to get past the elimination game and move on to face nemesis Broomall, tomorrow in the losers bracket semi-final. Jack Dougherty got the start and went 3 innings, leaving with a 6-5 lead. That score would hold as Sam Chase and Evan Johnson held Chadwick's down for the next three and a half. Avery Shepherd would come on to face their #2 hitter with 2 on and 2 out in the top of the 7th. Shep got him looking, and Wayne made history. Luke Kania led the Wolves at the dish delivering 2 singles and 2 RBI. Darien Pass had a double, and a sac for an RBI. Doc was 1-1 with 2 walks and a run scored, Evan Moore scored a run on a walk and a hit, and Shep was 2-3 with a run scored and RBI. Our 19 year-olds Darien Pass, Evan Moore, Dane Greisiger, Nick Holtz and Doc live to play another legion game. Which will most likely be vs Broomall, tomorrow at DEHS, at a time TBD. Wayne wins 1st Regional game on strong Humes outing, big hits. It took two days, but Wayne finally nailed down a regional win, beating the Yardley-Morrisville Sharks 6-2. The game started at Noon on Saturday 7/21, and was completed at 9:40am on Sunday 7/22, with inches and inches of rain in-between. Wayne sends a big high five to the Lionville Hillcats Legion program as they've been wrestling for days to keep the fields in condition to play the tournament. Cole Humes got the start for the Sr Wolves and held Y-M in-check until a couple of sloppy runs scored when the rain started to fall in the fifth inning. Humes' stuff was working as he struck out 7 (4 looking) in 4.2 innings, while only allowing 3 hits and 1 earned. The Y-M starting pitcher looked in the first inning like he was going to be tough to figure out, as he struck out the side. But the Wayne bats, especially those that have sung all season, couldn't be held down for long. Darien Pass started the noise in the 3rd with a stung single into left-center. Pass moved to 2nd on a wild pitch, then Cole Humes laid down a nice sac bunt to get him to third. Jack Dougherty followed with a high-chopper, infield single to make it 1st & 3rd, 1 out. Evan Moore then stroked a drive past the right-fielder plating Pass, and Dane Greisiger slammed a double down the leftfield line to plate Doc & Moore. And just like that it was 3-0 Wayne, up on a stunned pitcher that had handled them relatively easily for the first 2 innings. Humes slammed the door on Y-M with a shut-down inning in the top of the 4th and that brought Luke Kania up to lead-off the bottom of the 4th. Kania walked on 4 pitches. What happened next, not meaning disrespect to Y-M, was a comedy of little-league errors. The rain started to fall. Luke took a big lead off first. The pitcher threw over and Luke continued his run to 2B. The first-baseman gunned down to 2B, but his throw sailed to left-centerfield. Luke trucked around 2B and headed for 3B. The outfielder's throw then missed the cutoff, hitting the fence in front of the 3B dugout, and Kania cruised home, slightly exhausted. 4-0 Wayne. But the Wolves weren't ready to let the Sharks off the hook in the inning. Pass walked next, then stole 2B. Doc drove him home with a deep double down the first baseline. 5-0 Wayne, 2 outs runner on 2B. Up comes Moore again in the 3-hole. He promptly and smoothly poked a single to CF scoring Doc. The Y-M pitcher was done. 6-0 Wayne. As mentioned previously, Y-M plated a couple in the top of the 5th as the rain started to fall a little heavier. But that would be all for the Sharks. Due to heavy rain, the game was halted in the bottom of the 5th with 2 outs, 2 on, and a 3-0 count on Gavin McCall (hitting for Pass). McCall earned that walk Sunday morning, but Wayne couldn't get any more runs driven home. Evan Moore took the bump on Saturday, in the top of the fifth with 2 outs and runners on 1st & 3rd. He threw one strike to the batter. Before the next pitch was delivered, Y-M sent the runner from first trying to either get Moore to balk, or get that runner in a run-down, trying to score the runner at 3rd. This was not Evan's first rodeo. Moore calmly stepped off, checked the runner at 3rd, then fired the ball to Doc covering 2B from his SS position, and the runner was out by 10 feet. End of rally. Moore credited with 1 pitch, and one appearance. Moore finished the game Sunday morning yielding no further damage from Y-M and helping to seal the win for Humes and the Sr Wolverines. 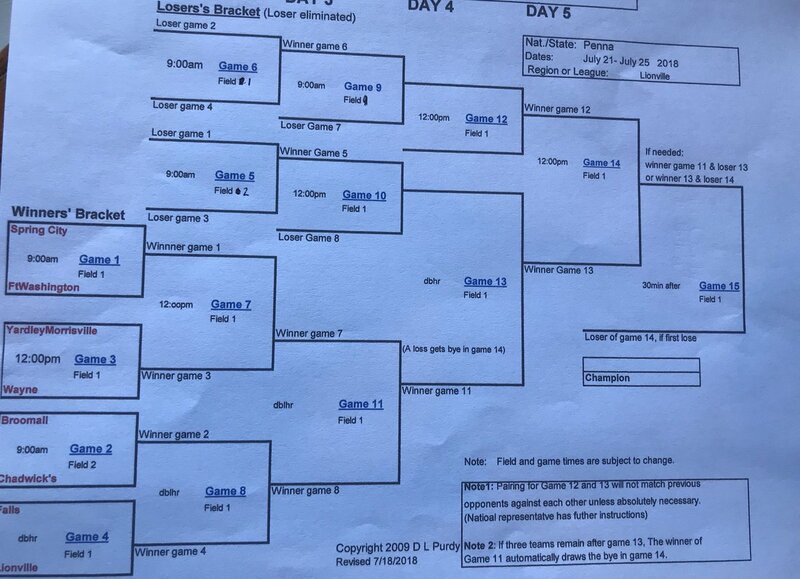 Wayne's next game, in the winner's bracket, is set for 10am Monday 7/23 at Downingtown West High School vs perennial power, the Spring City Red Sox. Wolverine fans, the bracket is set. Your Sr Wolves play at noon on 7/21 on field #1 vs Yardley-Morrisville. If we win, we play at noon on Sunday, if we lose, we play at 9am on Sunday. All games are at the Downingtown East High School/Lionville Youth Sports complex. Bring some cash as we believe they will charge for attendance and possibly for parking. Spread the word to fans and Wayne Sr Legion alum!! We look forward to seeing you out there, supporting your Wolverines!! Wayne Wins Main Line Legion for the 6th time in recent history!!! The Sr Wolverines are your Main Line Sr. Legion champions once again. That makes 6 titles in the last 11 years. 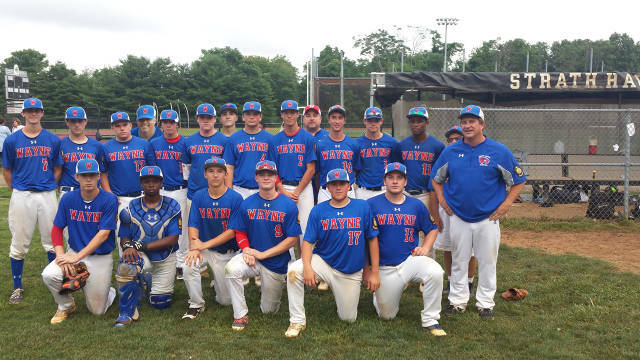 Wayne moves on to the Regional Tournament which will be hosted by Lionville Legion this weekend at Downingtown East High School. Wayne's game times are yet to be determined. The tournament is double-elimination. We are sure to have a game on Saturday (7/21) and a game on Sunday (7/22). Details will be posted on this site when they become available. come out and cheer for your Wolverines!! Wayne beats Nether 13-8 to close out winner's bracket!! It was unlike any other game of the 2018 campaign in that the bats, not arms, decided the outcome. Wayne pounced first, piling up 4 runs on 2 hits in the top of the first on the erratic Nether pitcher who walked two and hit one in the frame. Evan Johnson (RF) coaxed a one-out walk, and Evan Moore (P) followed with another. Dane Greisger (3B) then caught a ball on the shoulder to earn a free base, which brought birthday boy Avery Shepherd (1B) up to the plate with the bags loaded. Shep smoked a 1-0 pitch to the right-centerfield gap to plate 2 runs!! Jack Dougherty followed with a drag bunt for a single that drove in Dane, and then Nick Holtz (2B) slapped a fielder's choice that Shep was able to score on. 4-0 Wayne after 1/2 an inning. Nether Providence put up one in the first also, on a single and a double. After a scoreless 2nd, Wayne was hungry for more, and happy to quiet the chirping coming from across the plate. 4 more runs did the trick!! Dane led off and was hit again, in the shoulder. Then Shepherd, Doc and Holtz followed with three straight singles to make the score 5-0. Luke Kania (LF) followed with a fielder's choice that nabbed Shepherd at the plate, but the catcher's attempt at doubling Luke off at 1B, sailed down the rightfield line and Doc came around to score on the error. Cole Humes (CF) came up with two outs and drove a 2 RBI single to make it Wayne 8 - Nether 1. The score would hold until the 6th, partly due to (C) Sam Chase gunning down 2 runner's trying to steal 2B!!! In the top of the 6th Humes crushed a ball over the right-fielder's head for a double, then Evan Moore smashed one to the left-centerfield fence to drive him in. 9-1 Wayne. Top 7, Nick Holtz on 1st base via FC. Kania, who frequently finds a way to get on base, worked a walk. Grady Nance followed with a huge single to load the bases. After a FC sat-down Holtz, Evan Johnson strolled to the plate with 2 outs and the bases pickled. He came up BIG with a double between the left- and center-fielders to drive in all three!!!! Moore followed with a sharp single that plated Johnson for the 13th run. Nether had three outs left, down 13-5, bottom 7. They made the most of them and chased starter Evan Moore with one run in and the bases loaded. Matt Cohen took the bump in relief and coaxed an RBI ground-out, and two strike-outs sandwiched around an un-earned run scoring on an (E) grounder. The final batter went down looking and Wayne clinched a spot in regionals!! Moore didn't have his best outing of the year, but did enough, along with catcher Sam Chase, closer Matt Cohen and the defense, to hold off the potent Nether line-up. Moore's line: 8 runs, 5 earned, 10 hits, 5 k's, 1 BB, 1 hbp in 6 innings. Next up, Wane hosts Broomall Monday eve at Odorisio Park, 5:30 first pitch. Nether visits Narberth tomorrow at noon to trim the field down to 3 teams. Win or lose Monday or Tuesday, Wayne is qualified for regionals as the winner of the winner's bracket. Regionals will be held at Downingtown East High School 7/21-23, double elimination. * pics courtesy of Mike Nance, thx Mike!!! Wayne went on the road to play another higher seed in game 2 of the Main Line Sr Legion playoffs. Avery Shepherd and the Wolves left Springfield as 4-1 victors and now move on to face Nether Providence, the only other 2-0 team left in the playoffs. The game will be played tomorrow eve (7/13) at Strath Haven at 5:30pm. Shepherd went the distance ceding only 1 earned run on 4 hits, while striking out 6, walking 1 and hitting 1 batter. For the second night in a row, the damage was done by the opponent in the top of the first. Springfield's lead-off man smoked a full-count triple and was driven in on the next at bat. After that, not much noise at all from Springfield. Wayne scored 1 in the first inning as well: Evan Moore (1B) drove a 2-out double to deep right-center and subsequently scored when Dane Greisiger (3B) reached on an error, and the throw went down the first baseline. It was 1-1 until Wayne plated three more in the 6th on some timely hitting and smart baseball: Cole Humes (CF) led off, and reached on a HBP. Evan Johnson (RF) moved him to 2nd on a sac bunt. Moore drove home Humes with a single up the middle. Greisiger followed with a smashed triple that plated Moore. Then pitcher Avery Shepherd helped his cause with a nice squeeze bunt sac that plated Dane. Wayne 4- Springfield 1. Other offensive notes: Nick Hotlz (2B) was 2-3 on the evening, and the Wolverines only had 3 K's against 8 hits. Wayne beats Concord 5-1 on strong Humes outing, timely hitting. The 6th seed Wolverines traveled to Garnet valley High School to take on the host, 3-seed Concord. Wayne came away with a 5-1 victory and moves on in the Main Line Legion playoffs. Concord's first batter of the game scored after he singled and was moved around the bases by another single and an RBI ground-out. After that, Concord had no answer for Wayne's Cole Humes. Humes went the distance scattering 6 hits, and 1 walk to go along with 5 strikeouts and just the one earned run. The defense was solid behind their starter, and was highlighted by a 1-6-3 double-play to squash any thoughts Concord had of a rally in the 7th inning. Humes was instrumental in 11 of the 21 outs. The offense really came alive in the 4th and 5th innings: Dane Greisiger led-off the 4th with a walk, and promptly took 2nd on a delayed steal. Nick Holtz then singled to move Dane to 3rd. The rally was on!! Luke Kania came up and pushed a perfect squeeze-bunt between the pitcher, 3rd baseman and shortstop, scoring Dane and putting runners on 1st & 2nd. Grady Nance then drove a hard single to CF to plate Holtz, who beat the throw to the dish. Nance on 1st, Kania on 2nd. A couple of pitches after a fielder's-choice nabbed Kania at 3rd base, Nance pushed the issue and took off to steal 3rd. The catcher's throw went down the left-field line and Nance hopped up and trucked home to score the 3rd run of the inning. After Humes easily handled Concord in the bottom of the 4th, the 5th inning started with Evan Johnson reaching base on an error by the SS, bringing up the 3-hitter Evan Moore. Moore crushed the first pitch he saw to the right-center field fence, earning a triple and scoring Johnson. The Concord starter was done at that point. Dane Greisiger welcomed the new pitcher with a deep RBI fly-out to RF, scoring Moore and posting the 5th Wayne run. After that, the story was really Humes cruising through the final 9 Concord outs without much issue. Wayne travels to Springfield tomorrow eve, in the winner's bracket. Gametime 5:30pm. * pics courtesy of Mike Nance: thanks Mike!! Playoffs start Weds 7/11 at Garnet Valley HS vs Concord, 5:30pm. Too much Shepherd for Nether!!! Wayne wins 3-2. A one-run victory!! It was all-Shepherd, all the time for the Sr Wolves. Avery Shepherd, a recent Carroll grad, delivered his second quality start in a row. This time the Wolves were able to come out on top. 2nd place Nether-Providence visited Odorisio Park. The boys from the Strath Haven High School area only managed 2 hits off Shepherd, in 7 innings. 2 runs scored for Nether, neither earned. The rest of Shepherd's complete game winning line is 5 k's and 2 walks. The defense was solid behind Shepherd, helping the cause. Grady Nance was excellent at 1B, making several hit-saving plays. And Nick Holtz (2B) and Jack Dougherty (SS) were strong up the middle. After the 5 strike-outs by Shepherd, 12 of the remaining 16 outs were made by the infield, induced by great pitches. At the plate, only Dane Greisiger had more than one hit, however several had clutch situational hits. None was bigger than Sam Chase's sacrifice-squeeze bunt in the bottom of the 6th that scored Dane and put Wayne up 2 to 1 at the time. Nance also had a huge hit in the 6th, doubling down the first baseline to drive in Nick Holtz, who had walked, with the eventual game-winner. The first run was scored by Darien Pass in the 3rd inning. Pass led off with a walk, then, after Evan Johnson's perfect sac bunt moved Pass to 2nd, Evan Moore drove him home with an RBI single to center-field. Now that's baseball boys! Shepherd had himself a day at the dish too, delivering a double in the 4th and a timely sac bunt in the 6th to move Dane into scoring position. The win moves your Wolves to .500, right in the thick of it. We visit Upper Darby tomorrow eve to kick-off a home-and -home series with the Royals, who visit Odorisio Friday eve. pics courtesy of Mike Nance - thx Mike! Norwood came to Odorisio Park looking to avoid a season sweep at the hands of your Sr Wolves. They left still seeking their first win of the 2018 campaign. Wayne amassed 11 walks and 7 hits en route to a 12-2 win in six innings. Evan Moore got the start and went the distance allowing just three hits and no earned runs, while striking out 8 and walking 3. It was Moore's 4th win of the season and 3rd complete game. The offense was led by Jack "Doc" Dougherty, batting in the 5-hole. Doc was 2 for 3 with 2 RBI, 2 runs scored a walk, ROE and stolen base. Moore had a good day at the plate as well scoring three times on 2-3 hitting with 2 RBI and 2 walks. Evan Johnson poked a timely 2-RBI hit, and Dane Greisiger drove a 1st inning double so deep to left-center, the left-fielder is still walking back from retrieving it!!! Grady Nance worked productive at-bats with 2 walks, a run, RBI and a stolen base. The Wolves jumped on Norwood early, scoring three in the first and three in the second. Nance drove in Doc in the 4th to make it 7-1. Moore drove Johnson in, in the 5th, then he scored on an error created by a hard-hit ball by Doc: 9-1 after 5. Wayne needed 3 in the bottom of the 6th to engage the 10-run rule. Nance led-off with a walk, followed by Gavin McCall earning first on a HBP. Dillon Bevan came up with 2 on and hit hard ground ball. Norwood had some difficulty up the middle resulting in an E4, bases loaded. Evan Johnson stroked a line-drive single to score 2. 1st & 2nd, no outs. Moore came to the plate and drove the first pitch to right-center scoring Bevan for the 12th, game winning run. The win puts Wayne at 6-7-1. The Wolves look to avenge an earlier loss when they welcome Nether-Providence to Odorisio Park tomorrow evening. We look forward to seeing you at the top of the hill!! * pics courtesy of Mike Nance - thx Mike!! Humes leads Wolves in a Heat romp!! Cole Humes got the start for Wayne, as the Senior Wolves hosted the Haverford Heat at Odorisio Park. Humes was over-powering and dominant as the Wolves walked away with a 9-4 win that wasn't as close as the score. Only one unearned run came across the plate during Humes' watch, while he struck out 9, walked one and only allowed two hits in six innings. Nick Holtz pitched the 7th inning, getting his first action on the mound. Holtzy allowed 2 earned on 4 hits and 2 walks. Humes also led the charge from the plate going 3 for 4 with 2 runs scored. Wayne as a whole had their best offensive game of the season pounding out a combined 11 hits with zero strikeouts. Other offensive stars include Darien Pass who was 2-2 with 2 runs scored, and Avery Shepherd, 1-3 with a run scored and one RBI. The Haverford School duo of Luke Kania and Grady Nance each had timely 2-RBI singles and Dillon Bevan earned his first RBI of the season on a sharp single in the 6th inning. The bats truly are "heating" up as the playoffs approach. Next game is tomorrow eve @ Odorisio vs Norwood. Evan Moore gets the start. Norwood are still trying to forget the last time they faced Moore as they were no-hit in a 9-0 loss. We look forward to seeing you at the top of the hill! * all pics courtesy of Mike Nance - thx Mike!! Another one run loss to Concord!! Another good ball game. Wayne loses 2-1. Tonight's game saw Archbishop Carroll's Avery Shepherd get his first start for Wayne and it was a gem. Shepherd and the Wayne D held Concord scoreless through five innings. The hosts were able to piece together a couple of hits and some fly-ball RBI's in the 6th to steal the win. Shepherd only allowed 2 earned runs, 4 hits and 2 walks in 6 innings, and struck out 4. Wayne managed just 4 hits on the night as well: 2 by Evan Moore including a double over the center-fielder's head, an infield single & stolen base by Cole Humes, who also scored Wayne's lone run, and a single by Nick Holtz. Doc had the RBI on a hard ground-ball to 3B. Wayne has gotten some really good pitching from many different players this season. As the bats warm-up toward playoffs, we'll be in a good position to string it all together. Next game tomorrow evening @ Odorisio Park vs Broomall-Newtown. * Photos courtesy Mike Nance - thx Mike! Wayne & Moore too much for Springfield, Morris. Wolves win 3-1. It was a central league reunion of sorts as Evan Moore (RHS '17/Millersville University Club) squared off against Jared Morris (Springfield '17/Neumann University Baseball). Moore & Morris have met before. This time it was at Springfield High School for a Senior Legion clash. Morris was very good; he went the distance yielding only 5 hits and 1 earned run while walking none and striking out 8. Moore, coming off a no-hitter in his last start, may have thrown a 1-hitter in this one, were it not for the uncut infield at SHS (I know, writers are supposed to simply report the facts...what can I say...I'm a little partial). His line: complete game win, 4 hits, 5 k's, 2 walks, 1 earned run. Credit to Morris who was the only Springfield player to make solid contact, and had their lone RBI. The Wayne defense was very good behind their pitcher. Tommy Dee (2b) had his best game of the season, figuring in 7 outs, and Dane Greisiger made solid plays at third base. Jack "Doc" Dougherty was clutch at SS, and Sam Chase caught a nice game, paired in the battery with Moore. Offensively, Dane stayed hot with a 4th inning double and RBI. Darien "all he does is drive in runs" Pass had a clutch RBI single in the top of the 7th, and Luke Kania squared off with Morris delivering 3 quality at-bats, including an ROE, stolen base & insurance run scored (on Pass' single in the 7th). Moore went 2-3 with a run scored. The win brings Wayne to 4-4-1 with a visit to Concord coming up on Wednesday eve @ Garnet Valley High school. * all pics courtesy of Mike Nance - thx Mike! It was an away game at home for Wayne, as Norwood's field was unplayable, so we hosted at Odorisio Park as the visitor. The Sr Wolverines topped Norwood (Interboro H.S.) 9-0, due in part to a complete game, shutout, no-hitter hurled by Evan Moore. Moore went all 7 innings, allowed no hits or runs, struck out 4, walked two and hit one batter. Offense was sparked by Dane Greisiger and Moore. Dane was on base 4 times with a triple, double, run scored and a run-batted-in. He was only a homer away from the cycle!! Moore was also on base 4 times, scoring twice, and driving an RBI double. Darien Pass poked a 2-RBI single in the first to help jump-start the Wayne offense. Cole Humes and Gavin McCall were also on base twice, each with a walk and a single. Moore played a pivotal role on defense too as he was involved in 10 of the 21 outs, including a line-out double play: bottom of the 5th, the 8-hole hitter reached on error and advanced to 2nd base. Then the 9th batter hit a line drive that was snared by Moore on the mound. Jack Dougherty (SS) was quick to react and Moore spun and threw to Doc at 2nd to double-off the runner who had strayed off the bag. The win gets Wayne, who has a fielded a different line-up for every game, back to .500. Next game is Saturday @ noon vs Concord at Odorisio Park. Come out and support your Wolverines! The silver lining: your Sr Wolverines DEFINITELY lead the league in 7th inning runs! The visiting squad never gave up the fight and sent 8 batters to the plate in the top of the seventh inning, scoring 2 runs to tie host Haverford. For the second game in a row, Dane Greisiger came on to pitch, and helped hold down the opposition while your Wolves could get the bats warm. Greisiger pitched the final five innings allowing 4 hits and no earned runs. At the plate Dane kept the RBI streak going, driving in runs in the 5th and 7th. Evan Johnson also had a good game; he led off the game with a single and scored, and had 2 amazing outfield assists: twice gunning down runners at 3rd base from his right-field position. Zane Thompson-Bradley applied the tags! Evan Moore made his first career start at catcher and settled in quickly, throwing out 3 of 4 base-stealers. Moore had his best game of the season at the plate also: 3-3 with a triple, walk, run scored and a RBI. Other game notes include Darien pass going 1-3 with a walk, RBI and stolen base. Nick Holtz, who seemingly always finds a way, was on base 3 times, Grady Nance had 2 walks and a stolen base...and Cole Humes led off the 7th inning rally with a single, stolen base and run scored. While its not a win, its an effort the Wolverines can build on and earns us points in the standings. The Wolverines are back home tomorrow night, hosting Springfield for the second time. 6pm first pitch. Wayne struggles to get out of the gate, can't catch Narberth in 5-3 loss. Five of Narberth's first 6 batters reached base in the first inning. Wayne put the clamps on what could have been a bigger rally, and allowed only 2 runs to score. However it seemed the Wolverines were playing catch-up all night and eventually fell to the host 5-3 when a 7th inning rally came up short. Dane Greisiger was hot at the dish driving a double and a triple and earning all three Wayne RBI's on the evening. Nick Holtz was on base twice and scored a run, and Evan Moore was on base twice with a run scored. Gavin McCall poked his first hit of the season in the 2nd inning! The Sr Wolverines suffered their first loss of the season coming out on the wrong end of pitching duel. Wayne mustered just 3 hits and two walks while striking out 9 times against the Concord starter. Evan Moore took the complete-game loss ceding 4 hits, 2 walks and 2 earned while striking out 4 in 7 innings. Wayne had a chance in the 7th, down 3-1. Moore led off with a walk, and Darien Pass followed by taking a pitch off the shoulder. An errant pick-off throw behind Pass at 1B allowed Moore to go to third with one out. Luke Kania drove a sacrifice fly to center field to make it a one-run game. That brought Zane Thompson-Bradley to the plate. ZTB smoked a 2-strike single to deep left-center. Pass trucked around the bases and made for home plate: the tying run! The fairy tale ending was not to be as Concord made a couple of good throws and was able to nab Pass at the dish to secure the one-run victory. A couple defensive gems of note: Wayne turned a sweet double play for the 2nd night in a row: 5-4-3 (Bonini/Holtz/Bradley). And Nick Holtz made a spectacular diving catch on a pop-fly, running back from his 2B position into right-centerfield. Next game is Friday vs Narberth @ Harriton High School, 6pm. Matt Cohen took the mound at Odorisio Park in game 2 of Wayne's 2018 season, facing a previously undefeated Springfield squad that was last year's district runner-up. Cohen was more than up to the task, hurling 6 innings while ceding only 4 hits, no walks and no earned runs. The defense behind the Radnor rising senior was nearly flawless, vastly improving on a rough game one defensive showing. Jack "Doc" Dougherty mopped up with a "3 up, 3 down" 7th inning. At the plate, Haverford School flashed the offense with Joe Bonini and Luke Kania delivering 2 hits a-piece. Bonini added 3 key RBI as well, driving in Evan Johnson in the first and Darien Pass and Kania in the fourth. Nick Holtz, Cole Humes and Dane Greisger also collected hits and Wayne goes to 2-0 on the season. Web gems delivered by Gavin McCall with a great catch diving forward from his RF position, and a 5-4-3 (Greisiger/Holtz/Moore) double-play in the 2nd inning. Concord, new to the Main Line Legion League, comes to town tonight. First pitch 6pm @ Odorisio Park. Evan Moore gets the start for the Sr Wolverines. Wayne overcomes slow start to top Norwood 4-3 @ Odorisio Park. The Wolverines kicked off the 2018 Sr Legion campaign at Odorisio Park and rallied from a sluggish start to beat Norwood, 4-3. Tommy Dee and Evan Johnson (2B) each had a 2-RBI evening as Wayne posted 4 runs and 5 hits in the 4th inning. Johnson had a 2 for 3 night, Evan Moore added 2 hits, a walk and a run and Tommy Ball drove 2 singles and scored once. Moore also got the start and for the most part, held Norwood in-check striking out 11 in 6 innings and yielding just one earned run. Matt Cohen sewed things up in the 7th with a splendid 1,2,3 inning, earning the save. The young Sr Wolverines have some things to work on as 5 errors won't get it done most nights. However they did enough to get the opening day win and can enjoy the holiday weekend just a little more. Next game has Springfield visiting Odorisio Park on Tuesday 5/29, 6pm first pitch. Welcome to the 2018 Season, roster set!! Welcome back to Legion baseball!! We're ready to jump into our 2018 season, with the goal of once again winning the Main Line Legion District title. Here are the young men (starting first with returning players) that will go into battle along with Coaches Bryan Bendowski, Moe Mallory, and Paul Komorowski. Our full schedule is posted here on the site. Feel free to explore the various links including the 2018 Main Line Legion standings link. We look forward to seeing everyone at the top of the hill, supporting your Wolverines!